Objectives: To comparatively evaluate the efficiency of various chemomechanical caries removal agents in smear layer removal. Materials and Methods: Class V cavities were prepared on the buccal surface of 45 extracted, noncarious molars and were divided into three groups according to the chemical treatment received. 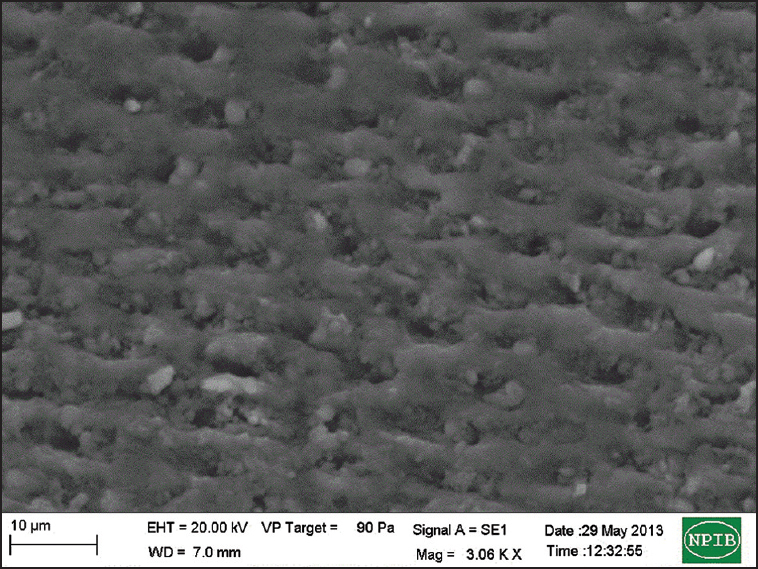 The samples were then gold palladium coated and viewed under scanning electron microscope. The presence of smear layer was evaluated based on the microscopic observations. 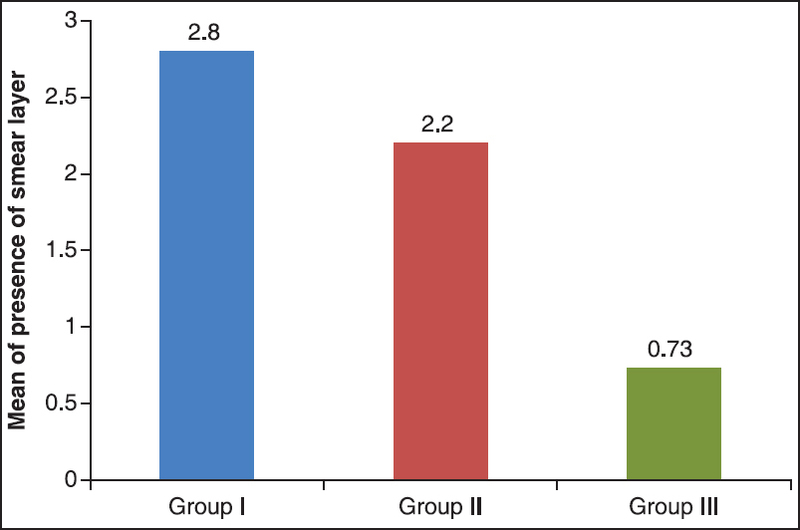 Result and Observation: The results indicated that smear layer removal was significantly higher in the sodium hypochlorite-based chemomechanical caries removal agents than in the papain-based chemomechanical caries removal agent and was least in the control group treated with saline. Conclusion: The smear layer removal was maximum with Carisolv followed by the cariecare and was minimum in the saline-treated group. The clinical outcome of dental restorations bonded to the dentine is dependent upon the ionic bonding formed with the hydroxyapatite crystals, which provides stable adhesion. This bond depends on the tooth preparation, presence or absence of smear layer, and the nature of restorative materials. The use of chemomechanical caries removal agents has gained popularity as they selectively and conservatively remove the infected carious dentine structure. But at times these chemomechanical caries removal agents are difficult to use in small inaccessible areas. Hence, in the cases where these agents cannot be used, removal of caries is done by mechanical means; which in turn leads to formation of smear layer. In this study it has been hypothesized that if we use chemomechanical caries removal agents as cavity conditioners, we might achieve multi benefits. Firstly, it will remove the smear layer; secondly, it will conserve the tooth structure when compared to the organic acids or chelating agents; and thirdly, it will also remove any carious portion if left in the unaccessible areas of the tooth. So this study was conducted with the aims and objectives to evaluate the efficacy of chemomechanical caries removal agents for removal of smear layer, to verify the surface roughness of the tooth structure after treatment with chemomechanical caries removal agents, and to compare the efficacy of various chemomechanical caries removal agents for smear layer removal. This in vitro study was conducted in the Department of Pedodontics and Preventive Dentistry, D J College of Dental Sciences and Research, Modinagar along with the Indian Agricultural Research Institute, New Delhi with permission from the ethical committee the letter no. DJD/IEC/2011/YEAR/571A. Forty-five noncarious extracted permanent human molars were selected for the study and were used within 3 months of extraction. These teeth were cleaned, autoclaved, and were stored in saline solution at 4°C to reduce deterioration in storage. These teeth were then divided into three groups of 15 teeth each depending on the chemicals used. Standardized Class V cavities were prepared on the buccal surface of the tooth 1 mm above the cementoenamel junction. The cavities were prepared using high speed air rotor hand piece with a straight fissure bur no. 9. The cavities were measured with a Williams probe and Vernier callipers at 3 mm length, 2 mm width, and 1.5 mm depth. The cavities were then treated according to their groups. The first group received a wash with 0.9% saline for 30 s. The second group received two applications of cariecare for 30 s each followed by a wash period of 10 s with 0.9% saline solution. The third group received a similar application of Carisolv for 30 s followed by a wash of 10 s.
For scanning electron microscopic evaluation of surfaces for presence of smear layer and surface roughness, the samples were dried and mounted on the stubs and were then placed in the gold sputter for a 30 mm gold palladium coating. The samples were then viewed in a Zeiss EUOMA10 scanning electron microscope at 20 KV and 10 Pa vacuum viewing status at a magnification of ×3,000. The presence of smear layer was graded based on the scanning electron microscopic observations. This grading was done based on the grading system introduced by Rome et al., where grade 0 was absence of smear layer, grade 1 was moderate smear layer, grade 2 was dense smear layer with visible dentinal tubules, and grade 3 was dense smear layer with no visible dentinal tubules  [Figure 1], [Figure 2], [Figure 3], [Figure 4]. The surface roughness was evaluated by measuring the difference from the peak to the depression of the irregularities in the most inner portion of the cavity in the central region by the scanning electron microscope software. Three readings were taken from the photomicrograph. A mean was calculated and the surface roughness was obtained. The values were tabulated and were statistically evaluated using Mann-Whitney U test for inter comparison of presence of smear layer and Student's t-test was applied for surface roughness in the different groups. When an inter comparison was made in between the two groups for the presence of smear layer, the sum of rank for Group I was found to be 300 and 165 for Group II. The mean rank of presence of smear layer was more in Group I (20) than Group II. (11) The U value was calculated using Mann-Whitney U test and was found to be 0.001, which was statistically significant. The sum of rank for Group I was found to be 345 and for Group III it was 120. The mean rank of presence of smear layer was more in Group I (23) than Group III (eight) and the U value was calculated as 0.000 which was found to be significant. The sum of rank for Group II was found to be 345 and 120 for Group III. The mean rank of presence of smear layer was more in Group II (23) than Group III (eight), and the U value was calculated to be 0.000 which was found to be statistically significant [Table 1]. This indicated that the minimum amount of smear layer was present in the sodium hypochlorite-based chemomechanical caries removal agent treated group followed by the group treated with papain-based chemomechanical caries removal agent and was maximum in the control group treated with saline. This difference was statistically significant among all the groups [Figure 5]. When an inter comparison was done for surface roughness in between groups, it was found to be significant in between Groups I and group II with a P - value of 0.000. It was also found to be significant in between Groups I and III with a P - value of 0.000. This difference was found to be nonsignificant in between Groups II and III with a P - value of 0.944 [Table 2]. 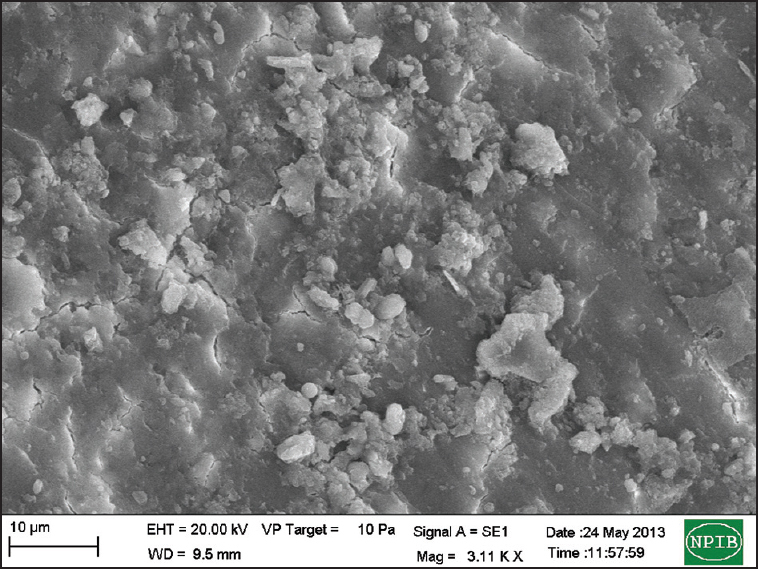 This suggests that the surface roughness was maximum in the sodium hypochlorite-based chemomechanical caries removal agent followed by papain-based chemomechanical caries removal agent treated group. This difference was statistically nonsignificant. The control group presented least surface roughness, which was statistically significant to the two chemomechanical caries removal agent treated groups [Figure 6]. The life of restoration depends largely on the formation of a satisfactory seal that prevents the microleakage, and hence secondary caries. The formation of this seal depends on tooth preparation, presence or absence of smear layer, and the nature of restorative material. Pashley et al., (1981) has shown importance of removal or modification of the smear layer for the development of this ionic bond to obtain optimal adhesion. 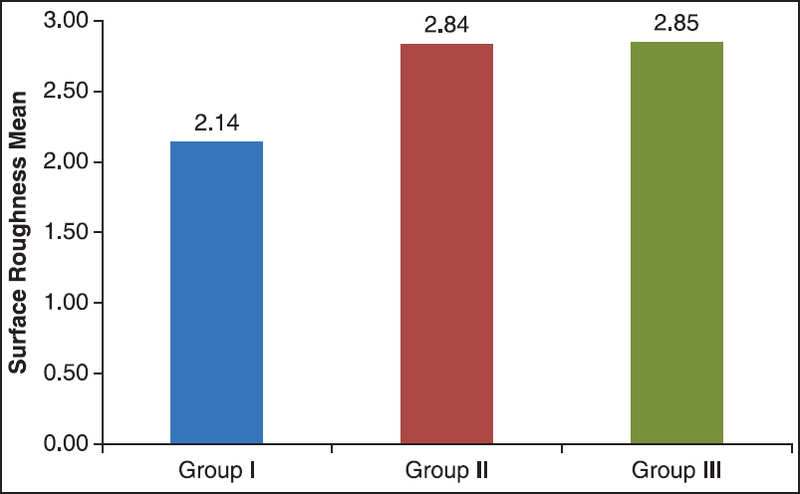 Thus, this study was conducted with the aim and objectives to evaluate the efficacy of chemomechanical caries removal agents for removal of smear layer, to verify the surface roughness of the tooth structure after treatment with chemomechanical caries removal agents, and to compare the efficacy of various chemomechanical caries removal agents for smear layer removal. As chemomechanical caries removal agents were evaluated on formed smear layer which was formed by mechanical cavity cutting on noncarious teeth. To standardize and to maintain the uniformity of the procedure, noncarious sound molars were taken instead of carious teeth. It was observed that Carisolv showed a better efficacy of smear layer removal than cariecare. It was found to be absent in the group treated with saline. The surface roughness was found to be highest in the Carisolv treated group than in the cariecare treated group and was least in the saline treated group. On the cariecare treated dentine, the surfaces were covered with residual contaminated smear layer with variable amount of dentinal tubule occlusion. Thus, the surfaces appeared irregular and scaly. It was concluded that the smear layer removal was maximum with Carisolv followed by the cariecare and was minimum in the saline treated group. The surface roughness was maximum in the Carisolv treated group followed by the cariecare treated group and was minimum in the saline treated group. Violich DR, Chandler NP. The smear layer in endodontics: A review. Int Endod J 2010;43:2-15. Rome WJ, Doran JE, Walker A. The effectiveness of glyoxide and sodium hypochlorite in preventing smear layer formation. J Endo 1985;11:281-288. Ganesh M, Parikh D. Chemomechanical Caries Removal (CMCR) Agents: Review and clinical application in primary teeth. J Dent Oral Hyg 2011;3:34-45. Pashley DH, MIchelich V, Kehl T. Dentine permeability: Effect of smear layer removal. J Prosthet Dent 1981;46:531-7. Correa FN, Rodrigues Filho LE, Rodrigues CR. 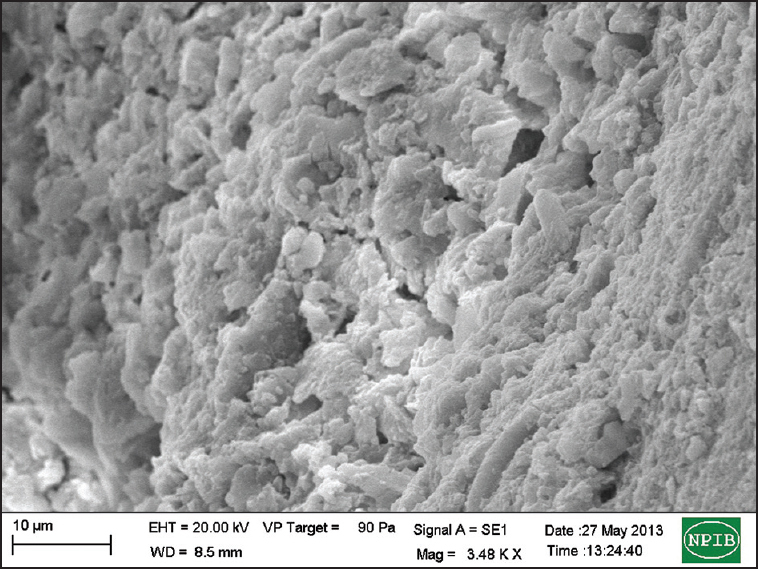 Evaluation of residual dentine after conventional and chemomechanical caries removal using SEM. J Clin Pediatr Dent 2008;32: 115-20. 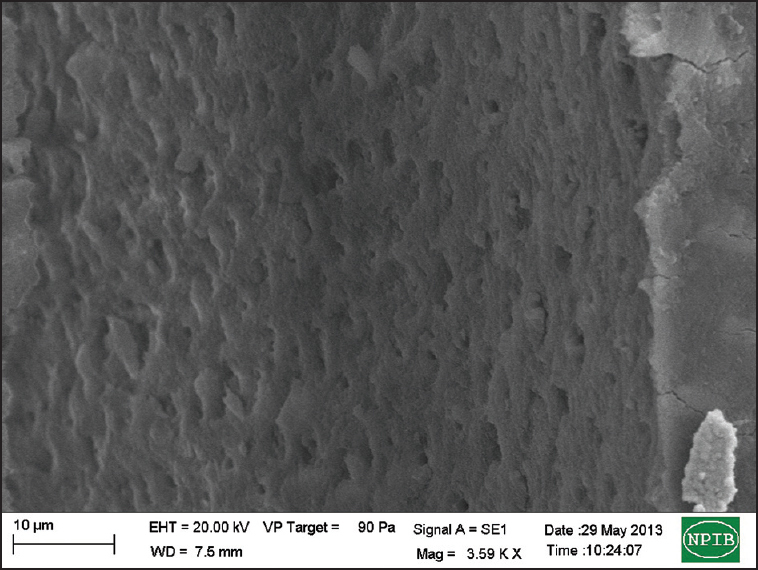 Brannstrom M, Johnson G. Effect of various conditioners and cleaning agents on prepared dentine surfaces: A scanning electron microscopic investigation. J. Prosthet Dent 1974;31:422-30.